Several popular series continue with new installments. 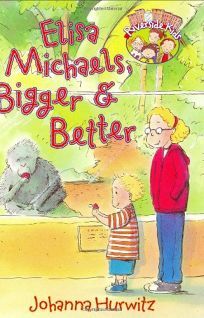 Elisa Michaels, Bigger & Better by Johanna Hurwitz continues the Riverside Kids series. A half-dozen stories highlight Elisa's newest adventures now that she's in second grade. In the first, she has breakfast with her Grandma-over the phone; in another she takes charge of her baby brother when the baby-sitter doesn't know what to do, and celebrates her half-birthday by eating nothing but chocolate all day long.